Before Vanishing is the evocative title of a new production of four Beckett shorts by the new Irish theatre company Mouth on Fire. Established in 2010 with the purpose of presenting Beckett’s work in ‘conventional, unconventional and site-specific locations’, the company has previously staged Catastrophe, What Where, Rockaby, A Piece of Monologue, and Play in productions which have garnered considerable acclaim from critics and theatre-goers in Ireland. Before Vanishing, directed by Cathal Quinn and premiered at Dublin’s Focus Theatre in April 2012, adds Ohio Impromptu, Footfalls, That Time and Come and Go to this repertoire and, in keeping with the company’s innovative approach to the Beckett canon, Teacht is Imeacht, an Irish-language version of Come and Go. The history of Irish language productions of Beckett’s plays is by no means substantial, yet, as with many interfaces between the Anglo-Irish and Gaelic literary traditions, it is not without its tensions. Beckett’s friend Con Leventhal, who was very critical of what he saw as the ‘Irishifying’ of Waiting for Godot in its first Dublin production at the Pike Theatre, dryly remarked in 1956 that ‘it may well be that Godot will do down in the local records as a lineal descendant of the works of the high literary kings of the Irish dramatic renascence. It is understood that there is a proposal to translate the play into Irish which would assist in bringing about a general acceptance here of this theory’. For some, translation into Irish was a crude means of reducing Beckett to the conservative literary culture and history which he would have seemed to have abandoned. Yet when an Irish version of Godot was eventually mounted in 1971, Beckett was reported to have been pleased with this development. Although only having a brief run in Galway and Dublin, Fanacht le Godot, directed by Beckett’s key Irish collaborator Alan Simpson who also took charge of the original Pike production, was a critical success and moved an Irish Times reviewer to fulfil Leventhal’s fears: ‘[U]ntil I saw Godot in Irish I didn’t properly understand how exactly Beckett takes hold of the Irish literary tradition … he is the legendary clever craftsman of humour, humour sexual and macabre, as ancient as the Táin [Táin Bó Cúailgne – a twelfth-century Irish epic] and as fresh as Finnegans Wake’. An important and successful decision was the playing of the original English directly before the translated version. This manoeuvre primes the audience for the possibilities of translation, especially in establishing an intriguing relationship between the very Anglo-Irish setting of the play and the new language in which its characters must now be reticent. 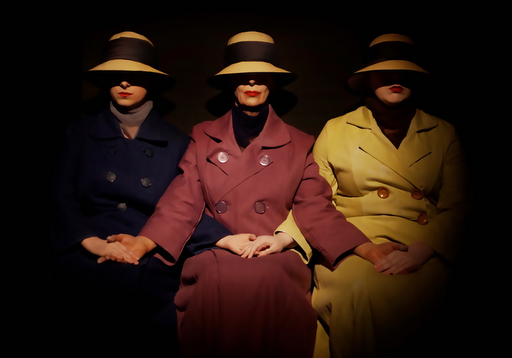 For an Irish audience, the Edwardian civility of these three women with very Protestant-sounding names, played exquisitely by Jennifer Laverty (Flo), Geraldine Plunkett (Vi) and Melissa Nolan (Ru), speaks quite clearly to Beckett’s origins; the reference to ‘Miss Wades’, a former school for girls on Dublin’s Morehampton Road attended by Beckett’s cousins, strongly evokes Protestant society in the city in the early twentieth century. There is also much of the ‘Protestant spectacle’, a sense of exposure in public space experienced by Ireland’s minority, in the visual provided by the three primly-seated figures, a dimension to a number of Beckett plays (most notably Happy Days and Rockaby). The transformation of these three ladies into Gaelic speakers has a unique effect in which the threat to the Protestant community represented by Irish as a language of public discourse is made tangible. The secrecy which surrounds the women’s situations is nuanced by an understanding that the language in which they hide a shared history also confers on them a marginal, even fugitive status. Teacht is Imeacht supplies a unique and vivid portrait of their besieged community and brings the extinct social world of Beckett’s youth eerily back to life. The play ends with a rare display of solidarity among Beckett characters with the three ladies holding hands. An interesting effect is achieved with the final line (‘I can feel the rings’ / ‘Mothaímse na fáinní’) in which the spectral rings, not ‘apparent’ in Beckett’s stage directions, take on the deathly status of Irish itself, the ‘fáinne’ being a key symbol of the Irish language movement. The cramped space of the Focus Theatre suited the featured pieces well, and the lighting (Becky Gardiner) and sound were masterfully executed, especially for That Time which was staged with great innovative zeal. Teacht is Imeacht has since been performed in the small Gaelteacht (native Irish-speaking) town of Carraroe, Co. Galway to coincide with the unveiling of a Beckett bust. Before Vanishing will be performed at the Galway Theatre Festival on Friday October 5 and Saturday October 6 and will also be staged in Tokyo at the Theatre X Cai in February 2013. Mouth on Fire will present Rocabaí and Blogh, Irish language versions of Rockaby and Rough for Theatre II, as part of the Borradh Buan Irish Language Festival at the Axis Theatre, Ballymun on Friday October 26 next.